Greensboro, North Carolina-based The Fresh Market plans to open their newest Atlanta area location March 9th. The new store is located on Scenic Highway in Scenic Promenade, a new shopping center that will also be home to Best Buy and HomeGoods (opening March 13th). 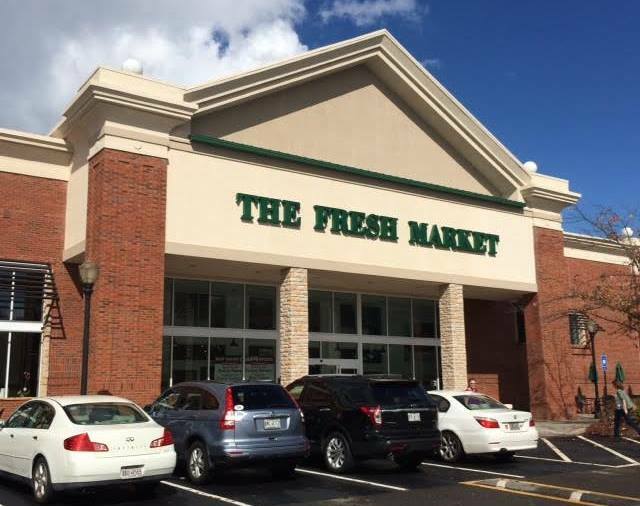 This The Fresh Market store will be the chain's 15th in Georgia. The Fresh Market announced in October 2015 that it was conducting "a strategic review of its operations that could result in a possible sale of the company." This week, a report by Reuters indicated that Cincinnati-based Kroger may be getting close to acquiring the chain. Tampa, Florida-based The Brass Tap plans to open its first Atlanta area location next Monday, February 22nd. The 4,400 square foot restaurant will open at Park Place shopping center on Ashford-Dunwoody Road near Perimeter Mall. The "craft beer bar" restaurant replaces the vacant Twisted Taco at the center. Business partners Samy Onsi and Mary Kate Roesch left their corporate jobs to open the franchise, which may be the first of a few in metro Atlanta. The duo reportedly have their sights set on additional locations in Midtown, Brookhaven and Vinings. The Brass Tap, similar to World of Beer, was launched in Florida in 2008, and was purchased by Tampa-based Beef 'O' Brady's in 2012. Metro Atlanta's newest Bojangles' opened yesterday in Doraville. The new restaurant opened on Buford Highway just outside the perimeter. Bojangles' has been expanding heavily in Georgia with additional new locations planned for Riverdale, Flowery Branch, Woodstock, Kennesaw and Chamblee. A new restaurant called "Rising Son" will be opening soon in Avondale Estates. Hudson Rouse, the former chef at Home Grown in Reynoldstown, and his wife Kathryn Fitzgerald Rouse, who created craft sodas for Todd Ginsberg’s The General Muir and Yalla, are the duo behind the new eatery. The restaurant will open at 124 N. Avondale Road in Avondale Estates, in the former The Bishop, which closed this past November. According to the restaurant's facebook page, Rising Son will serve "locally roasted coffee, freshly pressed juice, all natural hand crafted sodas, herbal-aids, classic cocktails, wine on tap, local beer on tap. Classic breakfast items such as local grits, hot biscuits, local bacon and sausage and house jelly. Some lunch items will include fresh big salads, grain bowls, featured sandwiches and our meat and three selections. Meat and Three options include country fried steak, chicken, pork chops, fish, brisket, pot pie and farmer friendly veggies, casseroles and salads." The facebook post also indicated that nothing major would be done to the space, leading me to believe it may open relatively quickly. The owners plans to "stay true to our southern artistic ways and focus on staying simple." Nashville, Tennessee-based I Love Juice Bar seems to have closed both of its metro Atlanta locations. As I noted last year, the Morningside location was sold and will soon reopen as Kale Me Krazy. The Toco Hills Promenade location reportedly closed around the same time, but the closure seemingly went unnoticed. Both locations were owned and operated by Cara Weaver. Buttermilk Sky pie shop has opened at the Gateway project on Roswell Road in Sandy Springs. The Sandy Springs location is a franchise of the Knoxville based company. Buttermilk Sky offers a variety of dessert pies but not not offer slices. Luxury clothing and accessories retailer Tom Ford has opened its boutique at The Shops Buckhead Atlanta. The Atlanta Dance Academy will be opening at Cheshire Square, at the corner of Cheshire Bridge and LaVista Roads, in the former Return to Eden grocery store. The 7,500 square foot space is being completely renovated for the new use. Sawicki’s Meat, Seafood and More closed February 14th on West Ponce de Leon Avenue in Decatur. Owned and operated by chef Lynn Sawicki, the restaurant has been in business for nine years with fluctuating sales blamed for the closure. Women's fashion retailer Elie Tahari is relocating its store within Phipps Plaza. Currently located beside Valentino and near Gucci, Elie Tahari will reopen later this spring in a space nearby most recently home to Anne Fontaine and Julian Scott. A new freestanding Krispy Kreme is planned for Northside Drive East in Statesboro. The restaurant will be roughly 3,000 square feet. Interesting thing about the new Best Buy in Snellville which recently opened is that the old Best Buy located directly adjacent to the new one was recently approved by the City of Snellville to become the newest satellite campus of the multi-campus megachurch - 12Stone Church. I agree - very sad Kroger got HT. Why is Kroger that cares nothing about quality or freshness of food doing so well? Ugh! Harris Teeter is lightyears better than Kroger. I shop there for my basics, but buy all meat and produce at Public or Whole Foods. Y'all kill me on this board when it comes to grocery stores, especially over Whole Foods, Trader Joes, Fresh Market and Earth Fare. Why is Kroger doing so well? The prices are waaaay cheaper than any other chain. I give credit to Publix for having the best deli and bakery, but if i can get bread, eggs and milk cheaper across the street then it's Kroger! Most solidly middle class and above want AND need another option besides basic Kroger and Publix. While I like having Sprout's in Snellville and glad they are going well, their parking lot and location are horrible to get in and out of. The Fresh Market, albeit on our traffic nightmare unScenic Hwy, will offer premium products with better access to get in and out of. Being able to grab prepared to go items or a larger variety of fresh ingredients to take home instead of eating out. The Fresh Market is not going to be a basic everyday grocery for most people in Snellville but it will be a very successful store because the demand is there. I agree the obsession people have with Whole Foods and Trader Joe's is insane. If you want those stores then purchase a home close to one.